1 Board, Temperature Cntrl Board, Temperature Control, Thermo Environmental #8765 SO2 1 Trigger Pak - Socket Assembly, Uv Lamp, Thermo Environmental #8774 SO2 1 Base, Pmt, Thermo #8887, Mechanical Systems #75-8887 SO2 1 Board, Analog/Digital, Thermo Environmental Inst. #8943, Mechanical Systems #75-8943 SO2 1 Board, Pcb Power Supply - Thermo Environmental Inst. #8949, Mechanical Systems #75-8949 SO2 1 Board, Input, Thermo Environmental Inst. 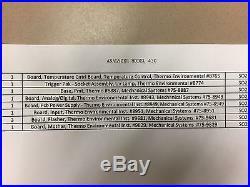 #8951, Mechanical Systems #75-8951 SO2 3 Board, Flasher, Thermo Environmental Inst. #9681, Mechanical Systems #75-9681 SO2 1 Board, Mother, Thermo Environmental Inst. #9829, Mechanical Systems #75-9829 SO2. The item "SO2 Analyzer Model 43C various repair parts per description" is in sale since Thursday, February 23, 2017. This item is in the category "Books\Nonfiction". The seller is "tlptlp0" and is located in La Crosse, Wisconsin. This item can be shipped to United States.